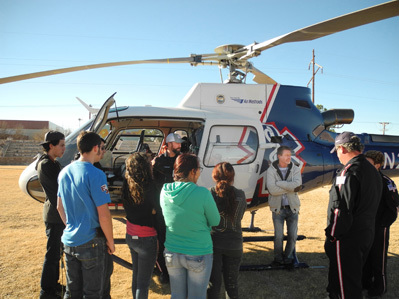 Students in Rick Wiles’ EMS classes at Artesia High School receive the opportunity to learn from Doug Tipton and his team from Air Methods air ambulance service of Carlsbad Monday at Morris Field. Tipton is the chopper pilot and flies with a team of two – a nurse and a paramedic – as second responders to accident scenes. The trio is known as Helicopter Emergency Medical Services (HEMS). Wiles’ classes are training to be EMS first responders in the dual-credit course offered at AHS through ENMU-Roswell and will be prepared to test for their first responders certifications at the end of the course.